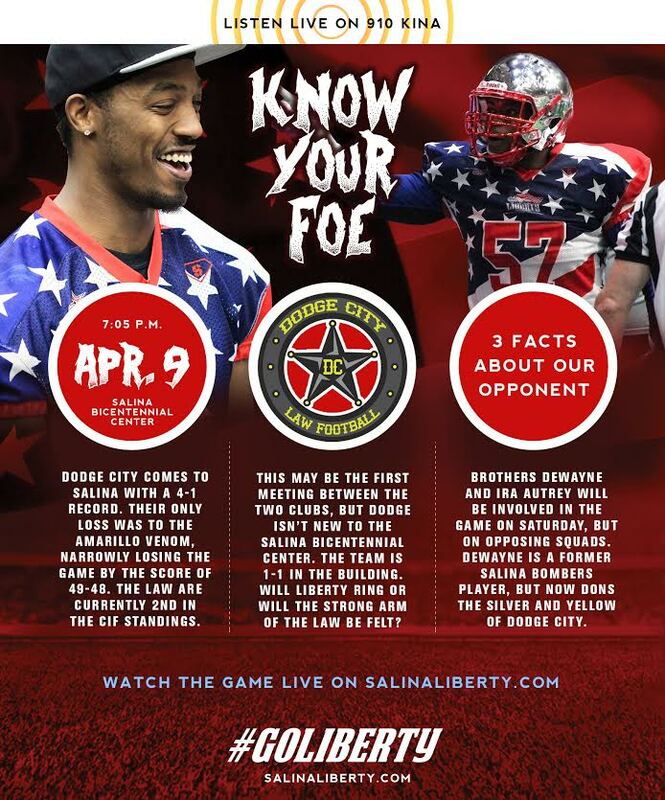 The Salina Liberty will return home Saturday night and will renew Salina’s rivalry with the Dodge City Law in the first ever “Tumbleweed Throwdown”. The Liberty, 1-3, will be looking to snap a two game losing streak and will be looking for their first home win of the regular season. Salina will once again to look to Derek Racette to lead the offense. In last week’s loss at Sioux City, Racette, in his first start, was just 7 for 28 passing for 53 yards. He threw 2 touchdown passes and 3 interceptions. He also rushed 11 times for 66 yards and 1 touchdown. According to Liberty Head Coach Eric Clayton, Racette is currently suffering from a rib injury. “We’re not sure if it’s broken or bruised, but he will play,” he said. The Liberty will enter Saturday’s game with three new additions to the roster. The club signed defensive lineman Tyrone Saunders, defensive lineman Ronald Johnson, and defensive back Thailand Pierce this week. Johnson, 6’3″, 300 lbs., could also see time on the offensive line. Johnson’s addition to the roster is likely due to the loss of Ed Prince for the season to injury. Saunders, a 6’3″, 335 lbs. defensive lineman, will likely also see playing time on Saturday in place of Adam Davis, who is also out for the season with an injury. Also on the injury list for Salina is star defensive back and return specialist Isiah Barfield, who has a broken hand. He is not expected to miss any playing time. Barfield returned 8 kicks for 215 yards against Sioux City. He also had 8 tackles in the game. Thailand Prince, who played for both the Amarillo Venom and Texas Revolution in 2015, could be playing for Dontr’a Matthews. Matthews, who had 3 interceptions in the loss to Sioux City, will miss this week’s game as he is attending a CFL tryout in Florida. Dodge City enters Saturday’s game with an impressive 4-1 record to lead the CIF Southern Divsion standings and will look to get a win to separate themselves a bit from Duke City and Texas, who are both 3-1. 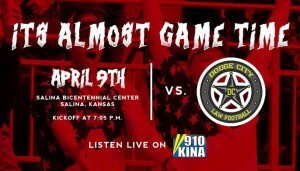 Salina will need to a win to potentially keep them out of last place in the Northern Division. The indoor football rivalry between Salina and Dodge City goes back to the previous Salina team’s tenure. In four games against the Law, the Salina Bombers were 2-2. They won the final meeting in Dodge City, 55-48, last May. Saturday’s match-up between the Liberty and the Law will be the first ever for the teams which are only separated by only 150 miles. In the spirit of building on the rivalry that already exists between the two cities, both organizations decided to have a trophy made that will be given to the winner of each game. A contest was sent out to the fans to determine what the trophy would be called. After dozens of submissions, it was agreed by the ownership groups of both teams that the contest between them be referred to as the “Tumbleweed Throwdown”. 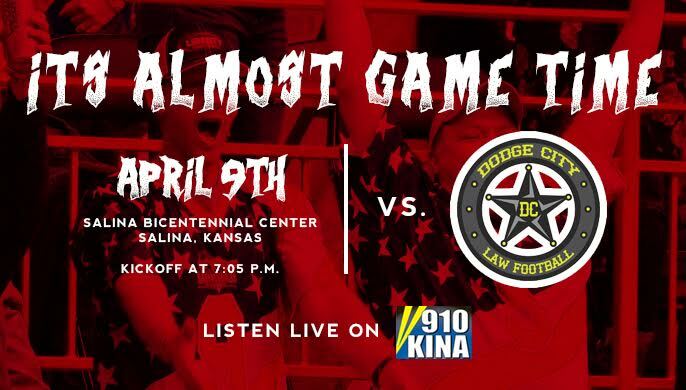 Kickoff is set for 7:05 p.m. Saturday night at the Salina Bicentennial Center. All the action can be heard on the official station for Salina Liberty football, KINA 910 AM & 94.5 FM, online on The Salina Post and also on the TuneIn Application, which is available for all Android and iOS mobile devices by simply searching ‘KINA’. Pregame begins at 6:30 p.m.